This past weekend weekend I ran the 27′ Contender Trade In down to Ocean City, MD where there has been a fairly hot white marlin bite. It was a fun weekend with beautiful weather and plenty of action! FRIDAY – I ran the boat down in the morning to OCMD and met up with Maureen at Sunset Marina around 9am. We got settled in and then ran out to the fishing grounds. We had line sin around 12:45 and fished between the South Poormans and the Washington Canyon in about 200-300 fathoms. We couldn’t seem to get a bite but were marking plenty of bait. We crept in to the 100 fathom line and raised a white on the teaser. We switched it off to the flat line and Maureen was on for the first white marlin of the trip. Unfortunately the hook pulled about 40 feet from the release. We got lines back on right away and as we were getting reset a white marlin piled on the right flat line ballyhoo/crystal party hat combo behind the dredge. We got a clean release on this one and got back to it, then had another white lazily follow the teaser but he wasn’t interested enough to take a bait. Not bad for 4 hours of fishing. We sprinted back home to make sure we were able to fuel up for an early am departure Saturday. SATURDAY – Saturday my friend Randy came along with us and we headed to the blue water in the South Poormans on the Triple 0’s. We found the edge in at 60 fathoms with scattered grass and a weedline that had plenty of mahi on it. We picked at some mahi, but they were absolutely destroying our baits. We went through 3 dozen baits in about an hour, but put quite a few fish in the box. We also managed to pick at a white marlin here and there from 65-90 fathoms and went 4/4 here with the crystal party hat/ballyhoo combo being the hot bait on the long rigger. I got word of a very good marlin bite about 15 miles down the line in the green water we had fished Friday, so we sprinted down there and spent out last hour and a half trolling around and only mustered up one more white marlin bite that we missed. Fun day and plenty of action. SUNDAY – We had pretty weather again on Sunday and Randy was along with us again. We ran straight back where we ended our day Saturday since the bite was so good there throughout the day and we had missed it on Saturday. Action seemed slower for most, but a few boats still got on the fish really good. We unfortunately were not that boat. We started the day with a white on the blue/white party hat ballyhoo combo but unfortunately pulled the hook in the turn. After that we had a white pile on the right long black/red party skirt ballyhoo combo and it was game on. This white was all over the place and almost ended up in the boat. We got a solid release and got back to it. The next white release came on the blue/white party skirt ballyhoo combo on the right long and we got the release very quickly since the fish stayed on top well. The next white we missed came in on the left long naked ballyhoo. That was pretty much all there was to it other then the super small mahi that would maul our baits from time to time. Overall, we had a blast and caught plenty of fish. Beautiful weather, lots of fun with friends, and good fishing! We took a ride in search of wahoo on the 27′ Contender Trade In. The wahoo have been on the lumps inshore of the Baltimore fairly consistent so we wanted to give it a shot. Unfortunately we got there and were greeted with green water. We still gave it a shot and caught one false albacore and got short bit by a wahoo. There was a bit of a white marlin bite out in the Baltimore so we monied out there and gave that a shot for about an hour, but it was way choppier then expected and it made it difficult to fish the way we needed to on the Contender. Regardless we pounded it out and managed to get a white on the teaser but it was lazy and never really committed. Since it was rough for us we decided to 8 knot it towards home wahoo fishing to knock off some miles and lessen the beating home and we got a wahoo bite when we crossed the tip of the canyon. Unfortunately the wahoo tried to eat the trolling weight instead of the bait and that was all she wrote. Tough day for us. Our final day (Friday) we ran 85 miles south to the southern rock piles. The action started great as we were 1/2 on whites, had another in the spread and had a few dolphin bites by 10am. We were fishing in 81 degree water in 55-80 fathoms and finding some scratches of bait but mid day was slow. We ended up getting a wahoo to stick to a circle hook and it took plenty of line getting into the braided backing with ease. As we got the fish close you could see the big ol torpedo turn its head and go for another run but as bad luck would have it, the hook pulled. We got back on the troll and pounded out the same general area. We saw a tailing white but never got a bite out of him then we finally got another white Marlin bite around 230. After we got him close to the boat, yet again, another pulled hook only feet from the release. Tough one for sure, and that was it for us for the Mid Atlantic Tournament this season. Today we fished our first day of the Mid Atlantic Tournament. We started fishing in between the Wilmington and Baltimore Canyon on the edge of a color change. It was slow going other then some small mahi and a White Marlin that snagged itself on the MoldCraft Super Chugger, but that didn’t last long as he threw the hook after a few leaps. With the slow fishing we picked up and made a run. But along the way we came across a pallet in 500 fathoms so we fired out the baits and immediately got into some action with gaffer dolphin. I made some adjustments to the spread to try and target a wahoo as well and we managed to scrape one out of there. After we exhausted catching fish off of the pallet from trolling by about a dozen times we picked up and continued to the 600 fathom lumps in the Baltimore. We managed to get a release on one white Marlin and catch a few more small mahi. Overall fun day and we are going to the scales, but the mahi and wahoo are both in the lower to mid twenties from my estimate. You never know though so we will see what pans out. Back at it again tomorrow and hoping for better Marlin action! I ran the Saltitude on this trip and we headed to the SW corner of the Wilmington on the edge of the break where there was a great bite the day before on white marlin. We saw a lot of bait on the colder side of the break on the ride out so we gave it a shot. We only got two mystery bites out of that. We wondered offshore into 200-300 fathoms around the North Heyes and saw two white marlin here, but neither gave us a bite. There was a lot of bait here and we kept working at it but only managed to get on white marlin bite out of it which we missed. A friend of mine slipped back into the 1 degree break in 80 fathoms and was picking at the whites pretty good so we slipped in there. It was one of those days where we watched everyone get hooked up around us and we could not buy a bite. I certainly had a sour face with this tough morning, haha. It was getting extremely frustrating until finally, a white came up on the left teaser and we got a clean bait and switch. We went into the turn and after the second time around the second white I marked popped up on the right dredge. We got a clean bait and switch on this fish and game on with a double. We released those two and the bite slowed down so we pushed back out to 100-200 fathoms where we got our third white on the right long. 3 whites is how we ended our day. I took a ride along to ‘mate’ for some friends on their boat ‘Digger’. 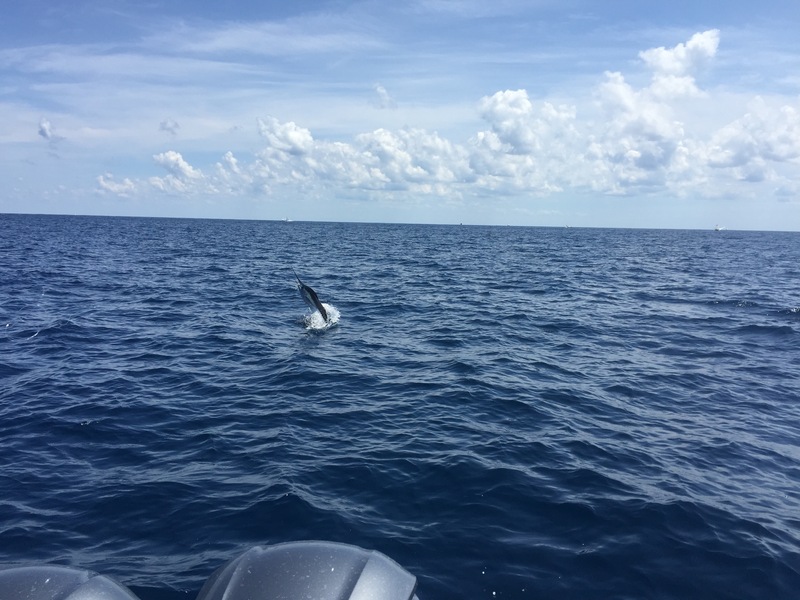 We ran out in search of white marlin on the 35′ Contender and it was perfect weather for us. Clear and sunny skies with blue water, doesn’t get much better for visibility when trying to see those marlin. We started inshore in about 45 fathoms and got mauled by mahi and wahoos. We shook off most of the mahi that were small and got bit off by the wahoos. We made our way out into 60-70 fathoms on the West Wall of the Baltimore where we picked at our marlin throughout the day. We ended up 6/6 on whites, saw 2 more, and 0/1 on blue marlin. Very fun day, and we came in early.